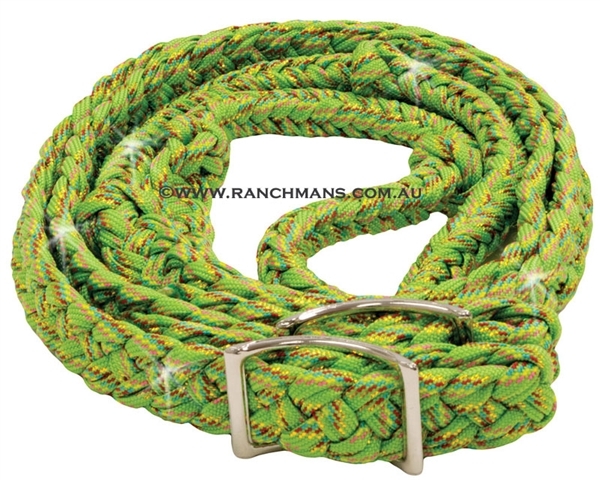 Ranchmans Confetti Glitter Lime Barrel Reins. Get noticed everywhere you go with these glittery reins. Gold glittery thread is woven throughout the length of this rein, turning an ordinary rein into an extraordinary rein. Flat braided ends with round braided hand hold. Four convenient knots to aid in positioning. 8' in length with heavy duty conway buckle ends. A great gaming, roping, or trail rein.